The Hawaiian Government is the world’s first to ban possession and sale of shark fins. Ripple effects from landmark decision are already being felt worldwide. As of July 1st, the Hawaiian State Government has become the first in the world to ban the possession, distribution and sale of shark fins and its already sending ripples to the rest of the world. "As far as I'm concerned it's no different than killing an elephant for its tusks or dehorning a rhinoceros for its horn. These are cruel and inhumane practices that have no business in a civilized world," said State Senator Clayton Hee, (D) Kahuku, Laie, Kaneohe. State Senator Hee, along with many animal advocates, reeled in the votes to make it illegal to have shark fins. "This is the first in the world. I don't how many times Hawaii has led the world but today it's leading the world and that's something to be proud of," said Peter Knights, Executive Director of WildAid. The new law means shark fin soup will be officially off restaurant menus. There is a one-year grace period for restaurants to serve their existing inventory of shark fin soup. However, they must obtain a permit from the state and they cannot bring in any new shark fins. There is also an exemption in the law pertaining to education and collecting shark fins for research. Local Chinese American actress Kelly Hu grew up with shark fin soup as a delicacy but now she wants to change that image. "I'm here to encourage other Asian Americans to help end the demand by talking, blogging and tweeting about this bill and encouraging their friends to support the bills in their areas prohibiting the sale and possession of shark fins as we have here," said Kelly Hu. 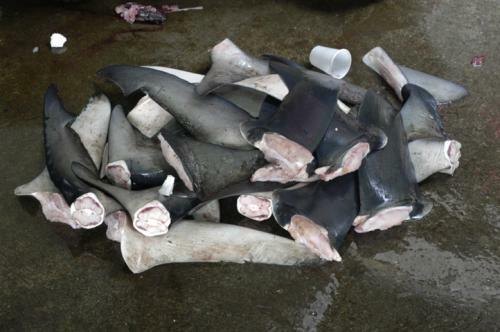 "The way to stop shark finning all together is to stop the demand for the product." Other states like California and even other countries are talking about enacting similar legislation. WildAid launched a campaign in China using superstar NBA player Yao Ming to get people to stop eating shark fin soup. "Our slogan is when the buying stops the killing can to," said Knights. "We had a big campaign to save the whales and that's fantastic. Whales are very important but sharks are more fundamental to the survival of our oceans, healthy oceans than whales probably ever will be."